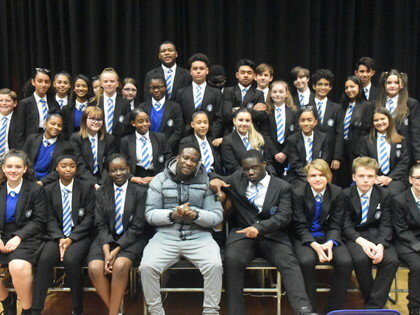 On Wednesday 3rd October, students had a very special visit from Kojo Funds. Kojo Funds is a British rapper and singer. His music blends West African and Caribbean sounds with grime, road rap, hip hop, dancehall and pop. He has now gone on to achieve fame as a performer. Many of the students didn’t know that Kojo was once attended the school (in 2006) looking slightly different and with the name Errol Bellot. Importantly, he spoke about using opportunities to create freedom, especially to travel and see new things. He advised them to see school life positively and to take advantage of the support offered to them. Many of our former students also visited as part of Kojo’s entourage and were greatly impressed with our students and talked about the great change to the school they remembered.